Whether you’re delving into IT initiatives such as private cloud computing and IT consolidation, or just trying to provide a high level of service to your business application users, you may increasingly find gaps in your ability to manage network and application performance. Riverbed® Cascade® gives you actionable information for network analysis and optimization, application performance management, acceleration of IT consolidation projects, and security compliance. 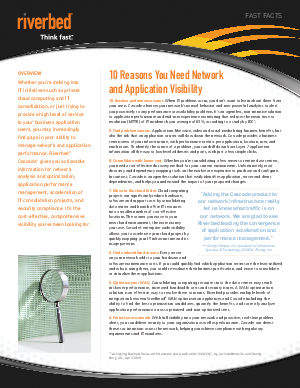 It’s the cost-effective, comprehensive visibility you’ve been looking for.